Cian Coleman scored Limerick's first goal on Friday. 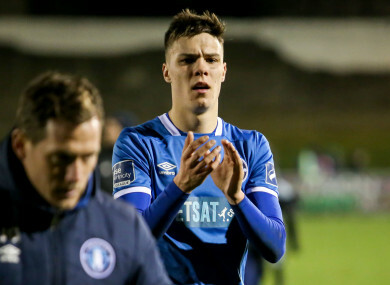 LIMERICK MOVED NINE points clear in second bottom as fellow relegation strugglers Bray have a mountain to climb to avoid the drop after falling to the Blues at the Markets Field. Bray made two changes from their 0-0 draw with Waterford before the break. Talisman Gary McCabe made a welcome return for the Seagulls, while Jake Kelly finally shook off a knock to join his namesake Daniel on opposite flanks. Limerick, scarred by recent departures due to financial strain, were forced to make four changes. Daniel Kearns and Mark O’Sullivan both left the club recently, while Killian Brouder misses out through injury and Shane Tracy dropped to the bench. In their stead came Barry Maguire, Connor Ellis, Karl O’Sullivan and Shaun Kelly. First, a nice link-up between Connor Ellis and Barry Maguire saw the latter square for a completely unmarked Cian Coleman. The young Corkman slotted calmly into the corner of the net, but that lead wouldn’t last long. Neither side seemed assured at the back and Limerick were guilty of taking their eye off the ball just five minutes after they broke the deadlock. A long ball from the back found local boy Ronan Coughlan completely unmarked. He dinked Brendan Clarke to level the scores. But the bizarre run of events wouldn’t end there. As Connor Ellis picked up possession down the left flank, he seemed to be going nowhere. But he got the run of Sean Harding and found himself marching into the box. He squared for the in-rushing Barry Maguire to tap home. Soon after, Martin Russell decided enough was enough and decided to take off Gary McCabe as two midfield runners had scored both Limerick goals. The Bray captain did not seem one bit pleased as he exchanged words with his boss before taking his seat on the bench. The second half was a non-event, and Limerick hung on after a switch to five at the back that paid off despite some late scares. Martin Russell will now have to produce a run similar to the one he went on in the later stages of the 2015 season with Limerick if they are to stand any chance of retaining their top-flight place next year. Email “Limerick secure a crucial three points to move further clear of struggling Seagulls”. Feedback on “Limerick secure a crucial three points to move further clear of struggling Seagulls”.